Washington and Heilbronn - the capital of the USA and the old city on the Neckar River in southwestern Germany have created a joint project about the architect Adolf Cluss. Exhibitions in Washington D.C. and in Heilbronn took place from September 2005 to mid-January 2006 to mark the 100th anniversary of the architect's death. Public events on both sides of the atlantic focussed on his life and work. The project included a series of events, a CD with music and spaces connected to Cluss, this website, and a book, entitled Adolf Cluss, Architect: From Germany to America, which is currently available in both German and English. 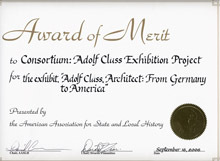 The American Association for State and Local History has granted an Award of Merit to the Adolf Cluss Exhibition. The AASLH Website states: "The Award of Merit is presented to recognize excellence for projects (including special projects, educational programs, exhibits, publications, restoration projects, etc. ), individual achievement, and organizational general excellence." Cluss-team members Dr. Bill Gilcher from the Goethe-Institut Washington and Prof. Dr. Christof Mauch from the GHI (German Historical Institute) Washington received the prize on behalf of the Cluss Consortium in Phoenix, Arizona on September 16, 2006.